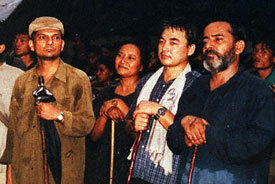 Left to Right: Nepalese Maoist rebel leaders Baburam Bhattarai, Hishila Yami, Ram Bahadur Thapa (alias Badal), and Pushpa Kamal Dahal (alias Prachanda) in a photograph found by Nepalese soldiers in western Nepal, May 11, 2002 (Photo: AFP-Getty Images). The seven-month-old peace process between the Nepalese government and Maoist rebels has virtually collapsed. On Aug. 27, the rebels unilaterally withdrew from a cease-fire that has been in place since Jan. 29. Prachanda also cited the government’s refusal to discuss the possibility of rebel political participation in Nepal’s Constituent Assembly and the Aug. 17 killing of “19 rebels and civilians” in the Ramechhap district of central Nepal. On Aug. 24, the Maoists had threatened to withdraw from the cease-fire if the government would not agree to include discussion of their participation in the Constituent Assembly within 48 hours. That ultimatum expired on Aug. 26. Life in eastern Nepal came to a complete standstill Aug. 27 as the rebels called for a one-day strike to denounce the army’s attacks on rebel cadres. The cease-fire had looked increasingly tenuous over recent weeks as clashes between the government’s highest security wing, the Royal Nepal Army (RNA), and the Maoist militia escalated. An estimated 35 people—most of them Maoist rebels—have been killed since the beginning of August. An estimated 8,000 people have lost their lives since the Communist Party of Nepal (Maoist) launched its “People’s War” on Feb. 13, 1996. Peace talks have collapsed twice before: in November 2001 and May 2002.